Tupperware containers aren't perfect but they're inexpensive and user friendly. I've stored tobacco for more than a year in dollar-store plastic containers with no noticeable loss of moisture. The plastic smell bothers me but even the mildest tobaccos seem to have more effect on the plastic than the plastic has on the tobacco. I've got containers that have been empty for months and they still smell like tobacco. I've started storing all my tobaccos in in glass jars with plastisol type seals (like canning jars). I like the purity and clarity of glass. Most good tobaccos come in 6-10oz. cans and wide mouth 1/2 gallon jars work well. The gallon jars should work well for storing a pound or more (its been a long time since I bought a pound). Regular 'wide mouth' canning jars, bigger than a pint, have too much of a neck and don't work well. The pint size canning jars are great for storing a few ounces of tobacco, or quite a few cigarettes, indefinitely. They're great for keeping a bit of premium (Charles Fairmorn, Auld Kendal, Three Castles) and/or discontinued (Look-Out vanilla, Export-A, Galouses halfzware, etc.) tobacco for an occasional smoke.. Using glass storage jars with sealing tops is freaking brilliant! I went to Walmart and found two which perfectly suit my needs. One large for long term storage of bulk stores and a smaller one, for filling from the bulk storage, which lasts a few days. Thank You! I use Gladware containers for storing an oz. or two at a time instead of repeatedly reaching into the can and causing small bits and shake from tearing the "hairy" ends off of my hand-rolled smokes. Yesterday evening I put my rolling tray in my computer chair and forgot about it. Later in the night I absentmindely sat on it in the dark. I could feel the Gladware collapse but it popped right back into shape causing no mess at all and with no cracks in the seal. I can't recommend Gladware enough for short term storage. With the possibilty (dead cinch) of more taxes, I was thinking of stocking up on some of my blends. I was wondering if anyone has experience on how long tobacco lasts in D&R's vacuum packed 14oz packs. I've had some for 6 months that smoke just as well as the first one opened, but was wondering if anyone had any longer than that? I had only one pack that didn't appear to have the vacuum but no noticeable tear. Smoked that first. Also wondering how long it sits at D&R before shipping. Probably varies and unless someone's asked, only Mark and the crew would know that. Dave has a link to a hard-core tobacco storage site someplace herein; wait, here it is: [link] ; their main concern is more towards storing pipe tobacco in a manner which promotes proper aging, but certainly their methods apply to ryo/myo tobocco as well. I'd tend to go with the largest Mason or Ball jars I could find, with quality seals and tight clasps. If you repackage the tobacco in airtight glass jars, and store them in a cool place, it will last a _lot_ longer (theoretically, indefinitely). Paul just mentioned buying D&R tubs instead of bags because of one bag drying, repackaging would solve that and save him $10LB. With the scary murmurings going on, I've been thinking about buying another dozen 1/2 gallon jars which would increase my long term storage by ~7LBS. Thanks for the input Dave. Looks like the way to go. I'm stockpiling it. I put it in sealable plastic hazmat bags that I get from work and store it in airtight food grade five gallon plastic buckets. Wal-Mart has 1 gallon wide mouth glass jars I got 2 of them and 4 plastic 1 gallon The glass were 4 or 5 bucks which wasnt bad. So far I cant tell a difference in taste between the glass or plastic but both seem to keep the tobacco fresh, for at least a month anyway :) we tend to go through 5 lbs a month between the 2 of us. I purchased some of the same gallon size glass jars and plastic gallon jars at Wal-mart as Dave Brown did in the above post as shipping on them is as much as the jars themselves. The modified square shape glass jars have a nice 4 1/4" opening. The seal is not real great seems to be the coated cardboard type but it should seal good for a long time. They were $4.98 plus tax here in Ca. The plastic jars are taller and round shaped with just a plastic screw on lid no separate seal, 4" opening made by Rubbermaid and cost $2.61. I'm happy with them and they'll hold the 16oz. bags of tobacco. I also purchased there a bail type lid plastic container with a great silicone rubber type thick seal and a 4 5/8" opening. These were $5.67 ea. and will hold a 6oz. bag. How do you store your tobacco? I order way more than I can stuff @ any one time, and sometimes end up w/ stale smokes. Just wondering how you guys do it. I was thinking of either storing in a cigar humidor, or separating into small packages and vacuum sealing w/ my FoodSaver. Any ideas? I use a big tupperware type container called a lettuce crisper. keeps my tobacco fresh till it's gone. holds about a pound. got it for $1 or so from dollar general store. Hell, if you've got one of those vacuum food saver things, you're golden. I can't imagine there would be any easier or better way. Lock & Lock Containers On Sale! I just got a new glass canister from ikea. It reminds me of something from an old fashion candy store. It holds about a pound and half, has a silicone seal, and keeps the tobacco really fresh. It only cost $6. We have a newborn and I've been using the cans that baby formula came in. some are metal, some are coated paper. They are stackable. These things seal great and keep the tobacco fresh. hold about 1/4 pound. I figure that if they are good enough for dry formula, it'll work for my storage needs. Another item i use is called a lettuce crisper. It's "tupperware" type and holds over a pound. I have about six or so different kinds of loose tobacco for stuffing. I initially ordered a four type sampler from D&R(3.5oz each of:Windsale, Vengeur, Ramback, and Rowland) and have been keeping the tobacco in the containers it came in, but then have dried out quite a bit. I went out today and bought some pint size mason jars and am planning on keeping the tobacco in those. My first question is that I know that the tobacco can't have too much moisture in them or it will mess up my machine(Supermatic I). But when the tobacco is too dry(like the stuff that I have now is) then it burns too hot and is harsher then it is supposed to be. So essentially I am asking how should I provide the means to keep the tobacco at the right moisture content in the mason jars that the tobacco will be in. Alright now here is the second queston: I have a 14oz vacuum sealed bag of Vengeur that I got from D&R. Will the simple zipper closure be alright to keep at proper moisture? OK thats it with the questions. I apologies for leaving such and absurdly long post but I didn't know any other way to put it. Well... here's what I would do. First, let's fix your tobacco in the mason jars. Take a couple clean shot-glasses or or medicine dosing cups,ect.., whatever you can find, and push one in to each of the tobacco jars, kinda push them in to the tobacco half-way to keep them from tipping. Take a piece of paper towel, rip it in four pieces and fold each up so it fits nice and tidy in your shotglasses. Dampen it, drop it in the shotglasses, and seal the jars. The tobacco should be fixed in about a day. You could probably do without the shotglasses if you use distilled water, but you could moisten the tobacco too much and cause mold. Then it's garbage. Here's how I keep my big bags fresh. I use a big plastic jar (I think it was a cheese puff jar from office max)(gallon freezer bags work good too, and are less prone to wearing out like the D&R zipper bags do) and a boveda 65% humidity pack. Just unwrap it, and toss it in! It keeps the tobacco perfect! It's two way, so it drys the moist stuff, and moistens the dry stuff. You should be able to get them for about five bucks at a good cigar store, and it lasts 2-3 months. I have found that it's as close to the perfect humidity for stuffing and smoking as I can get. I haven't used Boveda packets since I noticed a bleach-like smell in the containers I used them in. I also had a situation with a container that has a bunch of baggies with an ounce or so of tobacco in them. I very seldom open it and at some point I noticed that all the baggies had a sticky feel. I removed the Boveda packet, replaced all the baggies, and haven't had a problem since. While I don't know the Boveda packet was to blame (the original baggies were different and it could have been something in the tobacco), the stickiness combined with the unnatural smell has me wondering just what is inside...I've emailed Boveda to see what they have to say about the smell. Thats weird. I have used my boveda packet for while... never noticed a bleach smell or sticky packets. what humidity level did you use? I can't tell the differece between tobacco moisten w/ wet paper towel vs. boveda either. It is weird. I put a 65%RH packet in a container last night and opening it today I smell bleach. The baggies got sticky, not the packet. I heard back from Tim Swail who said "The Bóveda packets should not give off any odors. We simply use salts, water and a food gumming agent within the packets." I'm wondering if these packets have the same ingredients as damprid. Or something close. Mason jars are airtight and a great, no maintenance, way to store tobacco. There's lots of options for getting tobacco up(/down) to the moisture content that works for you. See the Storage page. I would not use plastic containers. Tobacco absorbs flavors very easily. A tip from the pipe smokers is to use Mason jars (The type you use for home canning. You can get them at just about any supermarket). I like glass. I would probably use glass if I could find good-sealing affordable containers with a big enough mouth. I think the idea of plastic affecting tobacco taste is overrated. There was a post yesterday about three year old plastic-pouch stored tobacco that was none the worse for it. I've got tobacco that's been in dollar store plastic for over a year with no noticeable affect. I've got some plastic that smells like tobacco even after its washed. Plastic is inert. Its the manufacturing/functional additives (ppm > n%) that you can smell. FWICT you need heat and liquid to release and transfer those additives in any measurable amount. Tobacco stored at room temperature is not a transfer friendly medium/environment. It also appears that transference will go the other way if whatever is stored in plastic is higher in volatile organics than the plastic is (e.g. onions and my tobacco smelling plastic). I leave it in the bag until I'm ready to use it. For usability and reduction of shake I take it out of the bag. I put everything but unopened cans into Tupperware. For keeping small quantities long term I use 16oz. wide-mouth mason jars (anything bigger has a neck and is a PITA). 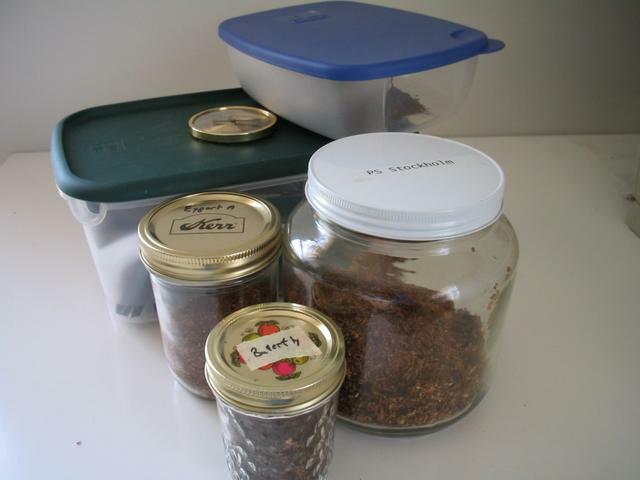 I agree with dave on using plastic containers for tobacco storage. I have several plastic containers I use to store my tobacco. They work fine even without any humidification device. "Me, too." I've been using the Glad 64-ounce "disposable" plastic containers. They have a good seal, so the tobacco stays consistently humidified. I periodically drop a meter in just to check the RH. The 64-ounce buckets don't hold enough tobacco, though: I can't quite stuff a pound in to them, only 12 ounces. I was either keeping my tobacco in the original containers or Tupperware until I stumbled past some containers at Target made by a company called "Lock & Lock" its like a square shaped Tupperware but it has a neoprene seal and four clasps on the lid that lock shut (one on each side). These things are great! and they are pretty inexpensive. I got a three piece set for $5.99 2.7QT/.75QT/.44QT the big one holds a 14oz bag of D&R (barely though) the middle one is perfect for a 2-3 day supply of tobacco for traveling with and the smaller one will hold about 55 tubes without allowing them to get crushed. I'm typically away from home 5-6 days out the week and these things hold up to being thrown around at work great, I am NOT gentle with my luggage. You can get them from amazon.com too but if you are in a Target or Wal-Mart give these things a look. Oh and they stack too! They also make a 1 liter rectangle that holds about a carton of finished smokes. Awesome for your business trips! I have 3 of them and I fill them all. Then I don't have to stuff so often. I wonder if one could use those Food Saver cannisters? I have a food saver, and have thought about experimenting with a small amount of tobacco and see what happens. Theoretically, it should work. They preserve things in their current state, wet or dry. I figure using the FoodSaver bags would crush the tobacco (they shrink around whatever is being sealed), so cannisters would be the only option. I'll have to experiment. I bet the cannisters would work. How do they preserve things? Can you buy them online? I just bought a set of those Lock and Lock containers at K-Mart for $19.99 (17 piece), and a round 1.9 Qt., and a 2.7 Qt. rectangular. here's the web site: [link] These containers seem to be made well. I like the seal on each container; which can be removed for cleaning, and the 4 way lock down tabs. Only time will tell if they are as good as advertised. Suppose to be 100% Airtight & Watertight, 100% Odor Proof, Stain Resistant, and has a Manufacturer's Lifetime Warranty. The small 11 Oz./0.3 Qt. containers in the set easily hold an Oz. of tobacco. These containers kind of remind me of ammo cans (the seal).